An evening in Ranikhet, four of us went for a run. It was past 5 PM. We made for one of the quiet side roads. We ran past the holiday huts of the army, down a few bends to the first of the `Old Grant Bungalows’ on that road, called so for their origin in British India times. It had just rained. There was a light chill in the air. The leafy vegetation around, the trees lining the quiet road and the road itself gave off that typical post-rain smell. Several turns away at the entrance to the Chevron Rosemount hotel, one of their dogs barked to announce the approaching runners. Used to seeing runners on that road every morning, it first resorted to barking and then settled down by the roadside. Two turns away, we passed the house of a friend who was a naturalist. Wonderful address for someone so – I always thought. We ran past the small trail cutting up the hillside, which we take when the daily run has to be kept short. This evening was different. We had resolved to run a longer distance, run the full length of the road and then turn off to Mall Road and Meghdoot Hotel. Another turn went by on the quiet road; then another. Finally we went past Adhikari Lodge, an old bungalow reportedly owned by a Mumbai business family who visit Ranikhet on and off. Although there were houses here, this area, compared to other portions of the road, was trifle more densely green. Four pairs of legs hit the ground rhythmically in slow run. Wind in the hair; nippy air on the face, a breathing that said `I am breath,’ in the chest. At the next turn, the first runner stopped. The rest of us caught up in one to two seconds. 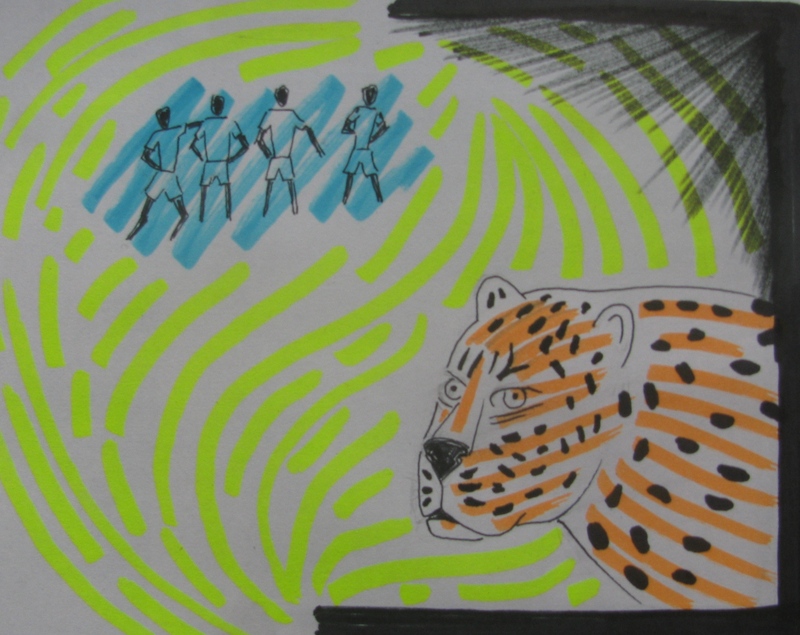 Walking diagonally across the sheltered road, with its back to us and seemingly no bother for its surroundings now invaded by humans – was a leopard. We watched it in absolute amazement. 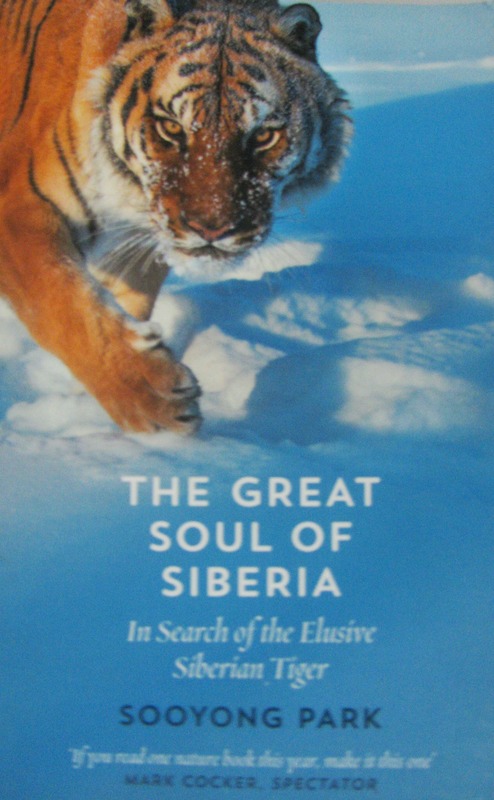 For all of us, it was the first sighting of a leopard so; free and unfettered. I suspect it was my shoe moving ever so slightly against the sand on the tarred road that created the faint noise – whatever, the leopard caught wind of something behind. It broke its leisurely walk to glance behind its left shoulder, sensed the four humans and in a couple of elegant bounds was up the other side of the road and lost to the dense vegetation between the road and the households beyond. It took a while for things to sink in. Slowly, our awe struck faces broke into smiles. We shook hands. Then we resumed our slow run. Leopards are not unusual in Ranikhet. But here’s the key according to my friend Ravi – don’t go looking around for the animal. I know quite a few people, including me, who went looking for leopard and never saw one. It was as though the shy animal read your mind and stayed away or you were too deliberate that your search affected your prospects. 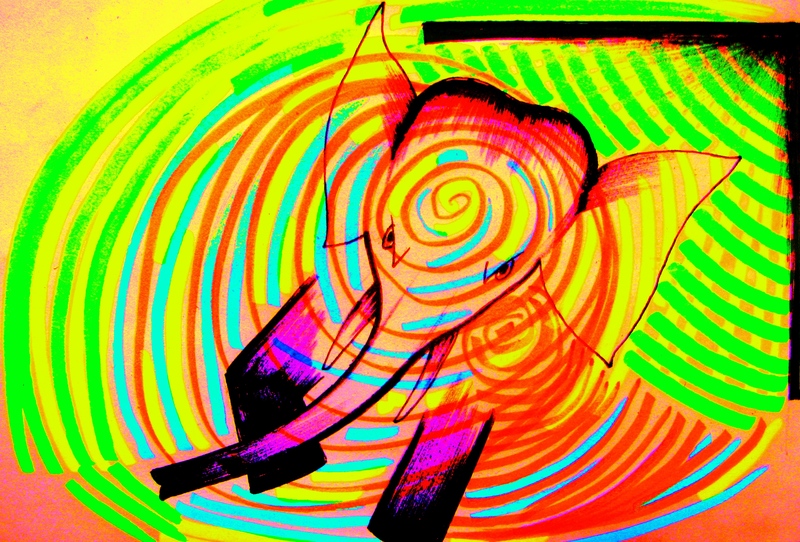 You know, too desirous of what you want that you become this big solid mass disturbing the universe’s subtle arrangement. Expect nothing and lo and behold, the universe rewards you. Leopard was the last thing on our minds that evening we ran. We saw one! I sometimes get outdoor work in Kumaon (the eastern half of Uttarakhand). That’s how I land up in Ranikhet, helping out at the India branch of the National Outdoor Leadership School (NOLS http://www.nols.edu). I have a regular running route; the earlier mentioned road; voila, my name for it – Leopard’s Walk. Past where we saw the leopard, that quiet road continues on; it skirts one side of the local tourist rest house property and eventually joins the road to the Jhoola Devi temple, in front of the West View hotel. From here you can either turn towards Meghdoot Hotel or take another quiet, isolated road, often carpeted by dry leaves and run all the way to the temple avoiding the main road. Some colleagues from the school choose to run further. There is a military check post at the temple and a stiff ascent of several kilometres that takes you to Chaubatia on top of the hill. The place is home to one half of Ranikhet’s sprawling military base. To my knowledge Ranikhet is one of the very few towns, maybe the only one in India that is home to two army regiments – the Kumaon Regiment and the Naga Regiment. Being military cantonment and located away from the normal Nainital-Almora route, Ranikhet has a quietness that is disturbed only by tourists and visitors. That’s why I like my morning run here. It is also why I rarely speak of it – for these days to speak of the solitude in some place is to invite its violation. Reduced shelf life is contemporary media’s gift to existence. For a relatively small town, Ranikhet has many people running. Most obvious and most regular are the soldiers. They fall into three categories – two, I profile below and a third general variety closer to jogging for fitness than running. On the road, the first group typically manifests as an approaching rustle ahead of me or behind me. Either way, they whiz past for they seem to be a dedicated team of endurance runners. They commence a run together; warm up exercises, stretches et al and then progressively spread out in accordance with individual pace. However they are never so spread out that the tail end doesn’t see the leader; their average pace is pretty good. Their youth and fitness crunches me like a tank running above the head of someone in a lowly trench. I have also occasionally met a slightly slower lot, who like to remain clustered as a distinct group. They run like a herd. My deduction is – they are the boxing team. It is nice to think of all these probabilities as one gets overtaken, lapped, left in the dust and forgotten, all the while happy for it as the morning air is much cleaner than the average Indian city’s, there is very little traffic and the early morning hours are enjoyably cold. Ranikhet’s civilian runners appear to fall into two categories. There are some who run regularly. More important – every now and then the number of civilians running goes up. When the numbers go up, you know bharti or army-recruitment is due. You find such preparatory running all over Kumaon; daily run done, candidates from everywhere converge at Ranikhet for that is where bharti happens. No army for me. I am the wandering, peace-loving middle aged soul, timid enough to avoid gladiators of all sorts and embrace a refuge, a trench. 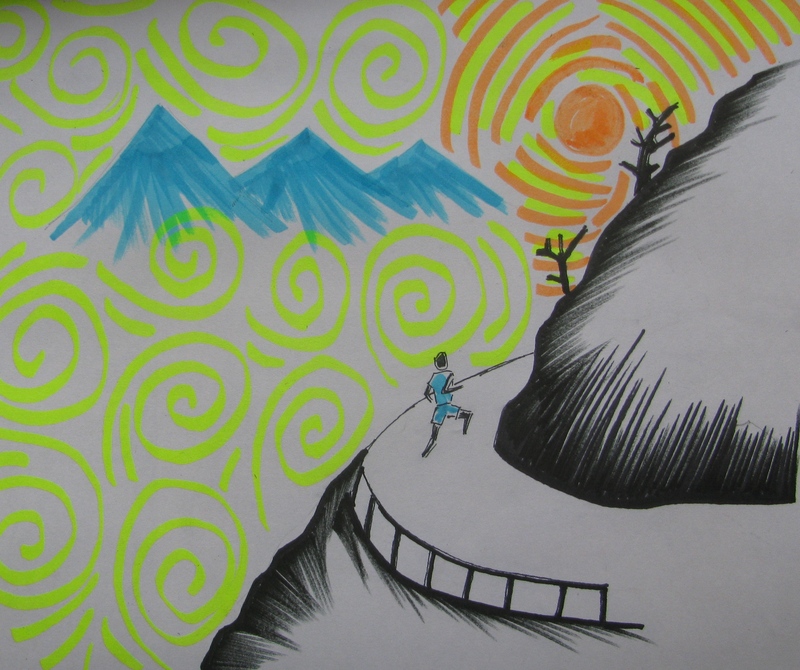 Much before I started running, I ran away – that’s the truth. Put an urban gladiator in front of me, I will run away again. I usually run alone in Ranikhet and when I have had company, it has been from the outdoor school. For some time, till he got married, Harish Singh was regular company. Indeed he was there when we saw the leopard. Twice, a local taxi driver with affection for running came running by and said – let’s go together. Narayan Singh (I think that was his name) was fine company for those two days. Once in a while, you see another visitor like me savoring the different ambiance of running in the hills. But that’s rare and I don’t blame those who choose to rest in their hotel rooms or go for leisurely walks instead. Fact is – the urban life is tougher, including the running therein. Back from the hills and running in Mumbai, I am exhausted in just one day coping with the heat and humidity; my respect for everyone sweating it out in the city. Whether I like it or not, the urban trend of organized running is catching on in the hills. From Leh to Mussoorie and places in between, there are staged events with calendar dates, gladiators and all. But I am partial to the unnoticed variety wherein running (I call my version of it – trotting) becomes a means to get around. The enjoyment I have had from this is immense and seductive enough to leave me with shin splints; that classic outcome of overdoing things. Plus, the terrain is undulating; there are long ascents and descents. That adds to the strain, which you don’t notice till injury settles in, well and truly in love with your shin. Still, unplanned running is fun. Once Ravi and I were in a car headed to Tehri for a conference. Our accommodation was at Chamba, which is up a hill from Tehri. It was a long drive from Ranikhet to Tehri and by evening, as we reached Tehri, Ravi was bored. He asked Dinesh, our driver, to stop the car and pulled out his unicycle. I changed to running shoes. We reached Chamba in style, a small traveling circus of sorts, runner in front; unicyclist behind. In Ranikhet, Ravi is often called ` circus uncle.’ Mountaineer, cyclist and outdoor educator, he maintains a small collection of cycles – MTBs, recumbent bikes and unicycles. Several days before Chamba, I had another impromptu, engaging run, rather trot – from Ranikhet to Katpudia (please try https://shyamgopan.wordpress.com/2013/08/03/katpudia/ for a story on Katpudia), which is slightly less than half way to Almora. Near Majkhali, I met the army regulars. As always, they checked me out – who is this terribly slow, old chap trotting by? Fit as a fiddle, their pace was whiz-class; they crushed me, tank-like. New element was – at the tail end of the contingent was their coach, on a cycle, periodically shouting, “ bhaag!’’ Rush hour went by thus and my cocoon of quiet refuge in the hills (call it trench), returned. I trotted to Katpudia, had a cup of tea at the local tea shop and took the share-taxi back to Ranikhet. The most satisfying run I have done in the hills so far was in Munsyari, from the town to Kalamuni Pass and back. The credit for getting me started on this goes to Love Raj Singh Dharmshaktu. As of 2014, he had climbed Everest five times besides ascending many other peaks in the Indian Himalaya (please visit https://shyamgopan.wordpress.com/2014/07/10/everest-to-the-east/). In June 2014, I was in Munsyari to write about Love Raj and every morning we used to run together. That season, our turn-around point had been Betuli Dhar, which is little over the half way mark to Kalamuni. Four months later, the whole route to Kalamuni and back, happened. It being late October, this was a much colder run with ones shoes getting wet six times in all as you have that many instances of stream-crossing (basically streams flowing over and across the road) to do. My face was numb from the early morning chill and cold. But as the sun rose over the Himalaya, I was blessed by sweet warmth. Blessed is the word, for every time I experience such sunshine in the mountains, I fold my hands in namaste to the sun. The preceding cold seemed just the right setting in retrospect – without cold, would you value warmth? In such life by opposites, is the joy of the outdoors. To see the leopard, you shouldn’t seek it. To run well, you should enjoy, not be deliberate. The best advice I ever received in the outdoors is this: if you are not having fun, then something is wrong. My idea was to have a cup of tea at the tea shop near the temple at Kalamuni Pass and then run back to Munsyari. But the tea shop was closed. I heard voices at the temple and approached. A Rasputin like-baba and three others, were making rotis. They beckoned me in. “ Sit; sit, would you like a smoke?’’ the baba asked cupping his hands to show the usual technique for smoking charas. I laughed comparing my state and need with the offer. “ No sir, I don’t smoke. But a cup of tea would be more than welcome,’’ I replied. “ Roti?’’ he asked. “No, thank you, just tea,’’ I said. Fortified by that excellent tea, I ran back to Munsyari and the beginning of yet another case of shin splints that would have me off running altogether by December. So I sit, grounded, in Mumbai. But there is one good thing about shin splints and no running. When you are the first Indian woman to ski to the South Pole, tough decisions are bound to have been part of your diet. 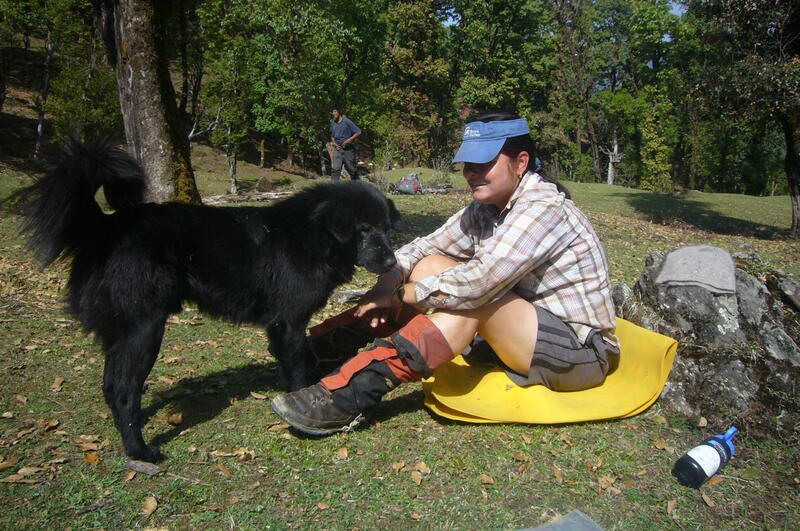 Yet Reena Kaushal Dharmshaktu struggled to be strict with the black dog that knew her well from past treks in the Pindari Glacier area and worse, seemed to know how to soften her resolve. As Reena said repeatedly, taking dogs out of their familiar territory can be hard on their lives. It was better that this dog stayed put at Khati. She had begun the day determined to enforce it. Kaalu though had a mind of his own. At first he stayed ahead of the trekkers slowly picking their way up to Khati Khal en route to villages east of the Pindari Glacier trail. Every time Reena caught up with him and shooed him away, the black dog – hence his name Kaalu – slyly fell back. He would almost drop out of sight only to emerge at the periphery of the trekkers’ world – typically lying down and nonchalantly watching humans huff and puff through his backyard. Early evening as we set up camp, we knew Reena’s best attempts to discourage Kaalu had failed. That night the newest member of the trekking party announced his role by keeping vigil and chasing inquisitive jackals away. Next morning, our group composed mostly of high school students learning the finer aspects of wilderness travel, were in love with Kaalu. The old trickster had got the better of Reena. She sat there smiling at him. We had another ten days or so to go. It was April 2011. The Young Leader India (YLI) course from the Indian branch of the National Outdoor Leadership School (NOLS) was underway. Reena was course leader; Gaytri Bhatia, who loved to run ultra-marathons, was second in command. I was Instructor-In-Training. Kaalu became mascot at large for the course. And he wasn’t mascot for one day or two – it was so for more than ten days. Some of us knew him well from previous walks in the region. Usually you found him lounging near Khati’s Jai Nanda restaurant, bordering the small ground where hikers pitched their tents. One of those mountain sheepdogs, Kaalu had exactly the looks and demeanour that would endear him to anyone. He could look at you expectedly as only the word expectedly meant, while you spooned food to your mouth. You patted him on the head and your hand sank into a cushion of eminently pat-able crown. If you didn’t give him any food, he didn’t complain, whine or create a fuss like other dogs did. He would stoically go back to rest like a hermit meditating on empty stomach; except, he knew that such behaviour elicited your respect and firmly reserved his seat for the next dinner. He was an investor; he worked on you quietly, patiently, diligently. He kept no particular loyalties to anyone and was therefore an outcast at Khati, a village where the habits of settled human life and by extension, the same for canines, appeared held in high esteem. “ Kaalu? That dog would go with anybody,’’ villagers would say dismissively. Man measures dogs by their loyalty to him. The more a dog has qualities revered by humans in other humans, the worthier the canine becomes. A dog loyal to one master or household was therefore dog personified. Kaalu’s sole loyalty was to food. Whoever provided it or hinted that they may provide it; he went along. The human aspects of the deal – he rationed it and played it like a master stroke; a sort of embellishment to what actually mattered. As in our case with no indulgence offered, he still managed to nudge the cards in his favour, hanging on long enough to make the human being feel guilty if such an unobtrusive guard dog wasn’t spared some scraps. Day after day, Kaalu stayed with us. He followed us into valleys; hiked up mountain passes, camped in the forest and near wild rivers. For the most part, he was well behaved, something I will come to a bit later. The only irritating things about him were the scruffy unwashed look that came with being the backpacker of the canine community; a weakness for cheese and a penchant to crawl into the instructors’ tent when the weather was adverse. What I remember most about him was something else. He rarely picked up a quarrel with another dog although a wanderer like him passing from one village to another was perennially trespassing territories zealously guarded by other packs. Barked and howled at – you could literally say hounded – from one end of a village to the other, he simply kept his cool and walked amidst the file of trekkers. It reminded me of seasoned human travellers. They lose their interest in the territorial defence of settled life, almost becoming useless for such defence. They would much rather keep their peace and take in the world, aggression, defence, shallowness and all. On the last day however, Kaalu met his match. Tiger of Munar village was not only fiercely territorial but he was also a good half size bigger than Kaalu. As the two dogs squared up in a fury of growls and bared teeth, the surrounding humans intervened to eliminate a fight. Had there been one, I doubt very much if Kaalu would have survived. Travellers rarely do for their mind is not in such householder-lunacy. Defend a piece of territory when a world waits? That day we dropped off Kaalu at Song, which is the official starting point of the Pindari trek. It wasn’t easy on the humans. The driver of one of our vehicles wanted to take him to Ranikhet; a student was ready to take him all the way to her house in Ahmedabad. Reena and Gaytri weighed the options and decided that the hill trails he knew were his natural home. A fortnight later, I was back in Khati. When he appeared, it was from the Pindari Glacier side, as usual, leading a group of trekkers. I have been a regular visitor to the Pindari, Sunderdunga and Saryu valleys. On several trips, I ran into Kaalu. 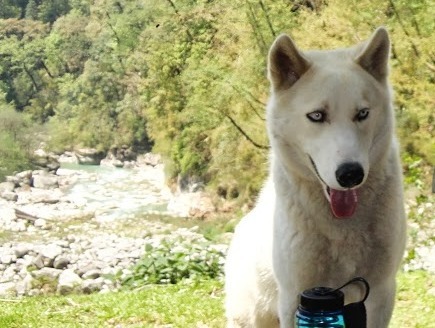 In May 2013, my cousin Rajeev and I had an enjoyable hike in the region that was memorable for the dogs we encountered. A cold evening, camped below Jatoli village, we were woken up from sleep by somebody saying hello. Outside were a Polish couple and their pet canine, `Duna.’ She was a Czechoslovakian Wolfdog. Over the next few days spent hiking into and out of the Sunderdunga valley, we got to know them better. The Wolfdog was trifle detached and aloof in temperament. Unlike regular dogs, it was mostly silent and never wagged its tail. Its expressiveness seemed to be in its eyes; how it tilted its face to observe, how it held its ears, how it listened. It rarely barked; it had a repertoire of whines instead, some imploring and questioning, others, stating. A big, lean, athletic animal, its body movements were deliberate, often slow. It had its playful moments but it often left me imagining a melancholic loneliness. It’s was a serious, soulful presence. Some days later, the morning we commenced a day hike from Khati to Dwali, we were accosted by a dog that was as white as Kaalu was black. It walked with us all the way from Khati to Dwali and back but never completely with us. It seemed shy of heart and soul-commitment. Clearly preferring independence, it hung around the periphery of our world drifting through life like a satellite orbiting a moving planet. Aside from the times we rested or halted for tea and snacks, it usually stayed ahead, pausing to look back and make sure that we were following. From its appearance, we quickly realized its Husky roots. It had brilliant, pale eyes and every once in a while chose to cool itself by lying down in the flowing water of streams. The nippy Himalayan air seemed too warm for it. Later, our deduction was proved correct. 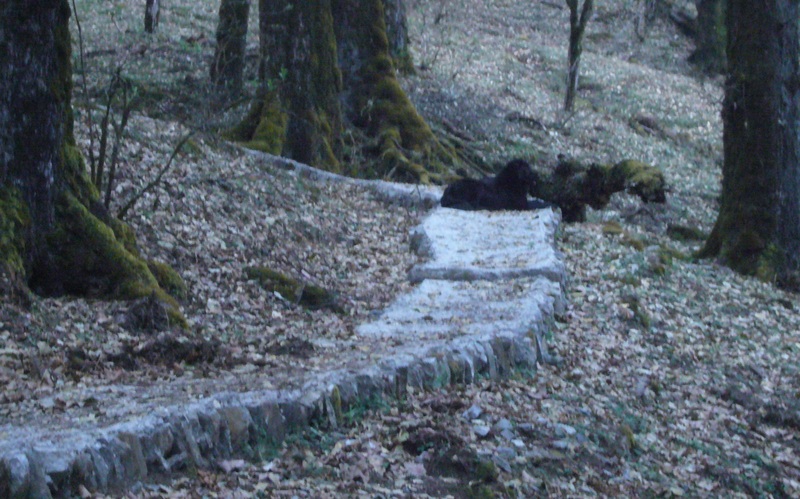 At Khati we were informed that the dog belonged to a Russian couple staying in the village. I have since looked up photos of Siberian Huskies on the Internet and those eyes and demeanour match.